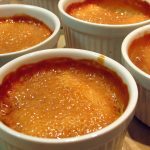 Think ‘lazy key lime pie’ – so great! Found on Food52, you can make the crumble the day before, and the crème brûlée-like pudding itself takes maybe 10 minutes. Whip it up first thing in the morning and you’ll have a brilliant treat waiting for you at the end of the day. I’m sure doubling the recipe (in case you wish to have people over and share! ), would totally work, just allow for more cooking time (and an even larger pot to boil the cream) – enjoy! For the streusel – add all 4 ingredients to your food processor and pulse until a cookie-like dough forms then dump all onto a small baking sheet, break it up into bite-sized clumps and then put it into the freezer and freeze until firm. Once the streusel bits are frozen, preheat the oven to 325 and line a baking sheet with parchment. Spread the frozen streusel out evenly on the baking sheet and bake for about 15 minutes. Be careful not to burn it, and remember that it will harden as it cools. Allow the streusel to cool completely before making the posset (I made it the day before I was planning on serving this). For the posset – whisk together the cream, sugar and lime zest in a large pot (larger is better for boiling cream!) and then bring the mix to a boil over high heat. Adjust the heat as needed to allow it to boil for 5 minutes then turn off the heat and whisk in the lime juice and salt. Leave this to cool for about 15 minutes. 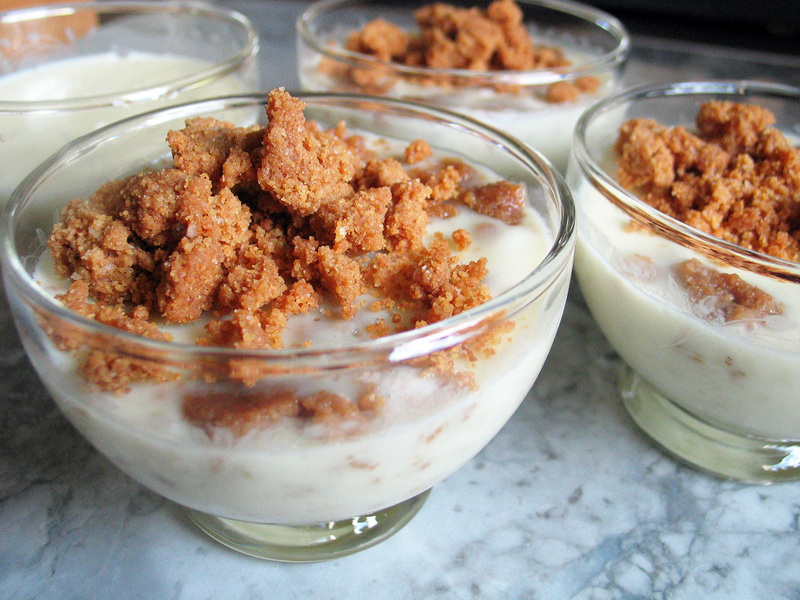 Add a layer of streusel to the bottom of 4 pretty glass bowls or ramekins, slowly pour (and evenly divide) the posset over the streusel, and then chill the bowls for a couple of hours until set. Garnish with more streusel and lime zest (I forgot this bit) before serving.